Well, I just rearranged my yarn cabinet to squeeze my newest purcahses in there. Things are getting a little snug! The top shelf is three deep on the left and two deep on the right. The shortbread is full of smaller balls of thread. The middle shelf is three deep all the way across except for the shortbread tin (which is stuffed with mostly-used-but-not-quite-gone balls of yarn). The third shelf is mostly just one deep - all the skeins are laying lengthwise and stacked up - with just a single layer of other goodies stacked in front on the left. Yeah, it's a bit full. But it's not that bad. I mean, I don't even need to squish things to get the doors closed! Of course, this doesn't mean I need to stop buying yarn. 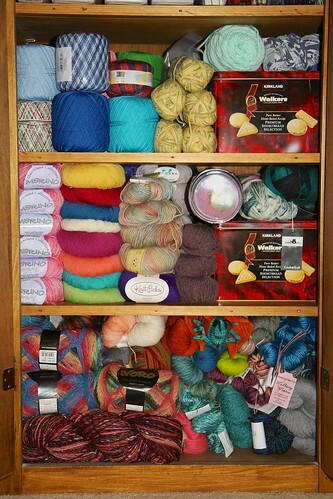 But maybe I need to rearrange things on the other shelves of my cabinet to give the yarn more room to expand. And knit faster. That would help, too. ETA: Oops. I just got the mail and it had a lovely package that had two more balls of yarn. Looks like I need to find some room! Yep, it's definitely giggle-worthy! Or cackle-worthy, as that is what I keep doing when I open the cabinet to glory at it. :) It's just so much fast to buy yarn than it is to knit it into things!